[Since writing and publishing this essay I have been to Boston, Alexandra Johnson taking me to the Isabella Stewart Gardner Museum. Here I saw everything I was writing about done correctly. Isabella Stewart Gardner's will stipulated that nothing could be changed. Frozen in time, this museum presents an enchantment, a profound study of the art of the world, in an ambience of hand-crafted beauty. We applaud 'Mrs Jack' for her indominatability, her splendid taste, her generosity to the world.]. oday has come a parcel with a catalogue and letter from Oxford, the catalogue of the Victoria and Albert Museum Victorian Church Art Exhibition, 1971-1972. It arrives on the same day that I am appalled at the loss of my Mother Foundress' memory, the notice sent to me that even her theological library now has its name minimized from the 'Mother Agnes Centre' to the (lower case) 'magnet'. Which reminds me of wrecking balls, smashing already smashed-up cars in which have been human beings into hunks of metal. Which reminds me of modern art in metal in churches like smashed cars. One sees it everywhere. I formerly linked to the Stations of the Cross, to the Via Crucis, and to the Bishop's Gospel, then removed those essays because of the ugliness of their metal sculptures. Even the Tabernacle now must be made of metal and modern. Florence's Baptistery is exquisite but for the tabernacle and candlesticks on its altar, jarring with all the rest. Cars "R" Us. Not the 'Word Become Flesh Dwelling Amongst Us', of Fra Angelicos showing Florentines in the pages of the Bible. Not beauty, but ugliness. The hand-crafted art of the Oxford Movement and the Pre-Raphaelites had, instead, drawn on well-springs of humanity and millennia of skills. Mother Agnes Mason, C.H.F. 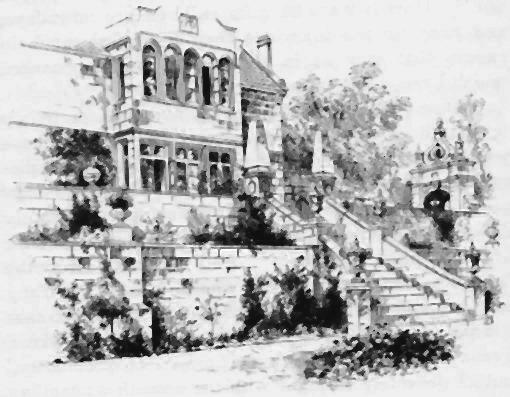 (friend to Baron von Hügel and many Oxford Movement bishops and clergy, her brother being chaplain to the Archbishop of Canterbury), had bought Holmhurst St Mary, Augustus Hare's home, for the Community of the Holy Family's school. Its Chapel was made from a stable, the model being St Teresa of Avila's chapel and monastery at Medina del Campo. Mother Agnes translated Teresa of Avila's Foundations, publishing it with Cambridge University Press. I had attended Holmhurst St Mary as a child from six to sixteen, my first classroom the most beautiful room 'Utopia' with its William Morris wallpaper, its carved Carrara marble fireplace, its black oak window benches from Barnard Castle, outside its windows the Italian Renaissance terrace and steps, copied from the Arson Villa near Venice. Another room was 'Arcadia', another 'St Teresa', yet more had the names of the letters of the Greek alphabet, everything as a map of learning and beauty. Wherever I had looked as a child there had been Della Robbias, Fra Angelicos. I have spent the rest of my life studying them, even coming to live in the Florence of these great artists. Tremendous learning, tremendous beauty, tremendous sanctity. At fifty-five, I returned to my convent to become a nun. But it was all changed, made ugly, modern and dirty, commercial calendars hanging up instead of Italian quattrocento art on its walls. The stable chapel deconsecrated. Then even that modernizing was removed, the large ugly Chapel to replace it they had built at such cost, and that could have housed their library, and their Convent, that could have housed readers and retreatants, all bulldozed, and the rest, the listed secular parts, sold off to developers, to turn things that had once been sacred and loved, into money. The drawers upon drawers of church embroidery thread sold off in boot sales, likewise the book-binding equipment, apart from what I have brought here and a huge portfolio of sepia Alinari and Brogi photographs of Florentine art, almost burnt in a bonfire, that my Mother Foundress had purchased in Florence in the nineteenth century where she had dreamed of our Community, while sitting in an olive tree. Their 'Mother Agnes Trust' will not tell me what happened to the artefacts and archives Mother Agnes Mason, C.H.F., so painstakingly acquired for her Community, beyond saying that the Chapel furnishings have been given to Gatwick Airport Chapel. What happened to the Sussex hand-crafted Pascal candlestick and altar cross, both made from the cherry tree in the Holmhurst courtyard? The altar cross with its silver facing with Hebrew and Greek from the Community's mottoes, 'How I love your Law', 'Mah abaoth Torathikah' from Psalm 119.96 and 'Let us be carried forward to completion', 'Pherometha', our Community motto, from the Epistle to the Hebrews 6.1? Do those handling these objects now know their history, their meaning? In the Victoria and Albert Museum Catalogue of their 1971-1971 Exhibition of Victorian Church Art I find this photograph, with the information that the artefact they are cleaning and repairing is item C24 in the Exhibition, an altar candlestick designed by Butterfield for St Andrew's Church, Rugby. And that this same shop created for Rugby's Rector, Canon A.V. 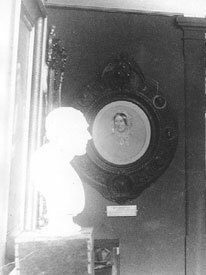 Baillie, a chalice which became item O21 in that Exhibition. For the Oxford Movement in religion and art rebelled against industrial machinery and human exploitation, valuing instead the Gospels' handcrafting and humanity, setting this in the heart of exquisite churches, in turn set in the poorest slums, their beauty of ritual and architecture being consolation. Such as All Saints in Margaret Street in London. Whose nuns laid out the bodies of dead paupers for their families. Mother Agnes was strongly a part of that revolution, having children be raised with a socialist sense of beauty, amidst hand-crafted art. She spoke of the Holy Ghost as the 'Eternal Loveliness' in her Conferences, and said that 'a sin against beauty is a sin against the Holy Ghost' in her Rule for her Community. 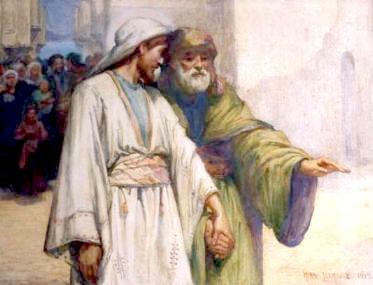 What happened to the Myra Luxmore paintings of the Annunciation, and of Christ healing the Blind Man? Like Holman Hunt, she had travelled to the Holy Land, and like him observed the exquisite Palestinian embroideries and fabrics. She had been friend to Gerard Manly Hopkins. What happened to the vestments and altar linens so beautifully embroidered by the Sisters? The Chalice modeled on one from Iceland? Everything removed from their context, what was clean made dirty. Meaning destroyed. Desecration. I remember and celebrate this now-lost Utopia. Though now only as a 'museum of the mind', a virtual museum, rather than a living place of work and study and prayer. I was on a Board of Directors for the Humanities in the State of Colorado. 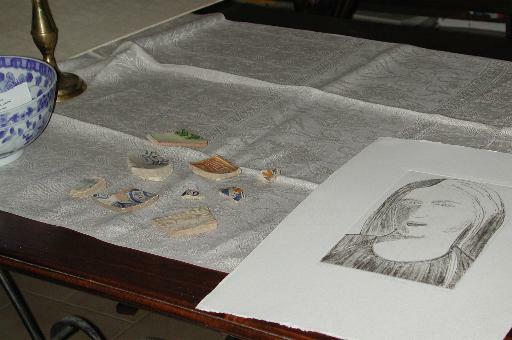 We were asked to fund a project on Penitente art. A Jesuit priest, Father Thomas J. Steele, had to plead with us that these artefacts be shown in their cultural setting, rather than ours. Telling us of Penitente women weeping in cold museums, asking why there were no candles in front of the bultos, the santos. Just once, I saw a museum done right. The Prado. The great Velasquez painting of the Royal Family of Spain, Velasquez himself mirrored within the canvas painting it, and on the walls, portraits of the King and Queen, and mirrors between candles in sconces, flanking them. Back and forth. Art and reflection. Reality and light. Museums should play games, contextual games with their art. Nor be afraid of candle light. So much better for medieval gold leafed saints. And my joy at hearing a voice calling down a corridor, 'Professor Holloway!' It was one of my students, studying in Spain in order to understand his Spanish Colorado. Travelling often to Florence to study manuscripts, I used to go to Orsanmichele, to pray and to light candles for my children. Then it was restored, candles forbidden, no blessed water in the stoop, turned from a church into a museum. Candles had been lit at Orsanmichele to the Madonna since the thirteenth century, to atone for Florence's war crime culpability in the starvation of Ugolino of Pisa and his progeny, as a granary to feed even the enemy in time of famine. Electric light can never replicate that of candles. I have been writing on Elizabeth Barrett Browing writing on 'Cupid and Psyche', drawing her inspiration from Apuleius' poem and from sculpture in Florence. Here Elizabeth describes Casa Guidi, richly furnished by Robert Browning with purchases from the San Lorenzo market, and with the statue imagined as on the console. 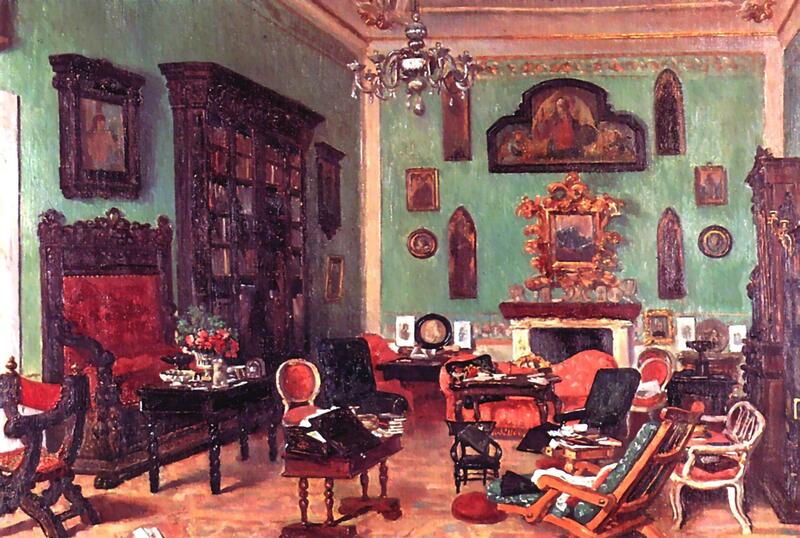 Giorgio Mignaty's painting of Casa Guidi for Robert Browning at EBB's death. When I was Curator there, Casa Guidi was just bare rooms. I asked that they be refurnished as in her day. And it was done. 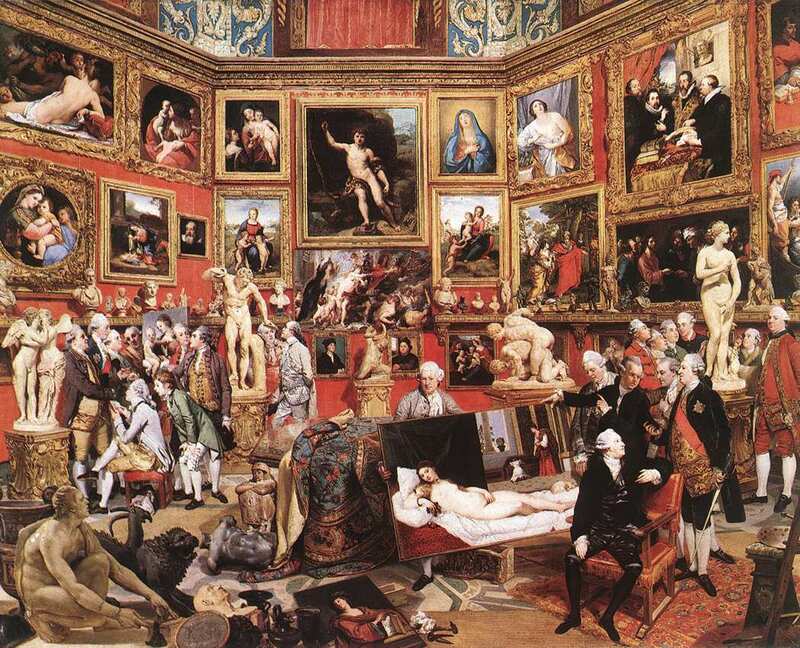 Elizabeth has appropriated the statue of Cupid and Psyche from the Uffizi's Tribune, seen here to the left in Johann Zoffany, 'The Tribune of the Uffizi', 1772-78. But today that statue of Cupid and Psyche is no longer in the Tribune. Folornly, in great need of a dusting, a scrubbing, it stands in front of a window at the end of a corridor. Forgotten. 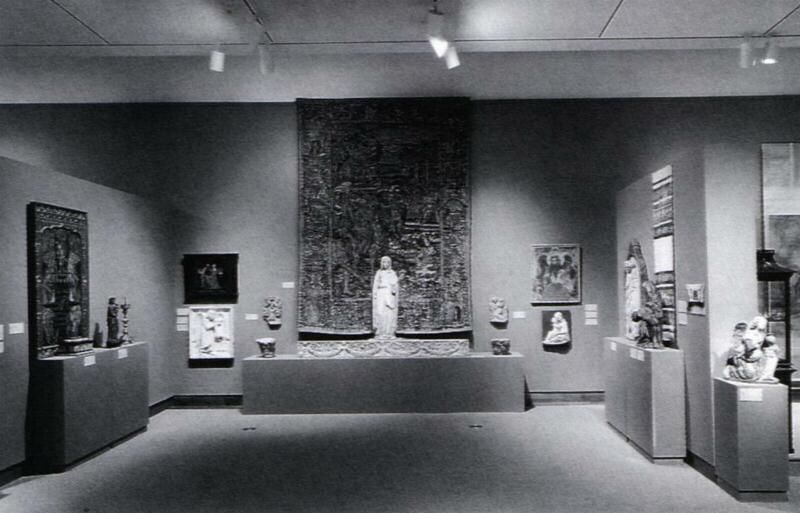 I am also browsing through the Record of The Art Museum, Princeton University, 56 (1996). 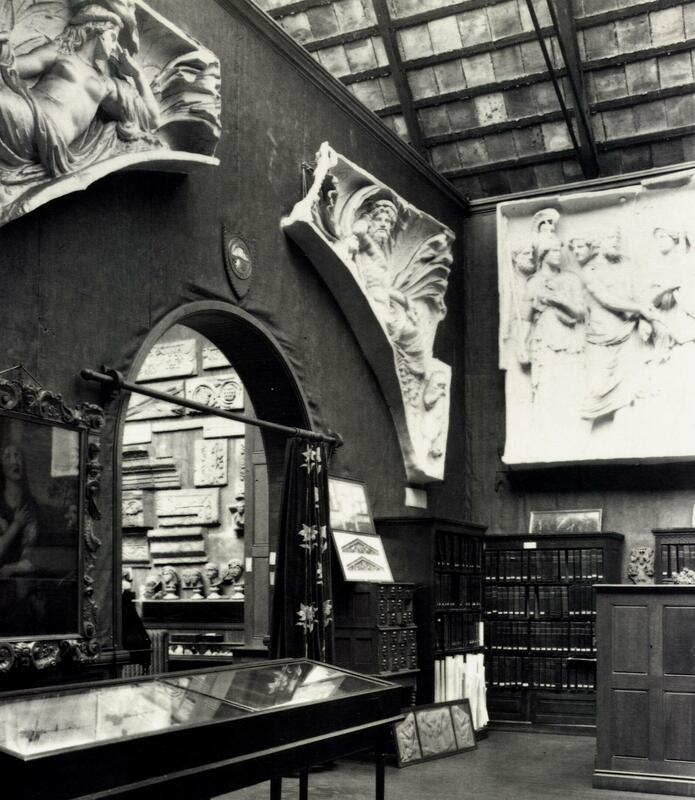 I am struck by the beauty of that collection in times past, before I knew it, a mixture of periods, a richness of art, the use of architecture, its ceiling like mine here in Florence, rounded arches, deliberate vistas of richness, skylights for natural lighting, altogether creating a harmony. But my memory of it, from when I taught there, is different, more coldly academic, fewer objects on show, divided into periods, displayed on white modern walls, with ugly modern lighting, cheap materials, lowered ceilings, instead of natural daylight. Painters know to paint in natural light, water colourists in the morning and evening, never at noon. Boxes, metal, plastic, cheapness, have become our 'museum style', a minimalizing and a sterilizing of the past, wrenching it into the modern. When I was young I appreciated this stark organizing by period. No longer. It does too much violence to what it should preserve, rendering artefacts meaningless, lacking all context apart from that of similar works. It reminds one of the wholesale destruction of medieval churches, wrenching them into the baroque, throwing away priceless Giottos to be replaced by boring Vasaris. I groan when I see square metal electric lights now placed in exquisite medieval Florentine churches, in exquisite Renaissance Florentine libraries. They are the beginning of the end, the rebellion against wood and circles, against what is natural, organic, and human. I, too, am director of a kind of museum. It is both a cemetery and a library. 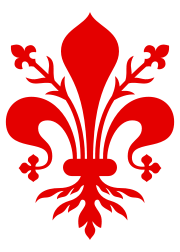 Its land was purchased from the Grand Duke in 1827; then the cemetery closed in 1877, when the medieval wall circling Florence was torn down, Code Napoleon forbidding cemeteries within city limits. We find we can do oral history, living history, amongst our dead. I have placed the register of the tombs on the Web, adding to it new information as it is given to me from all over the world, from Australia, from Africa, from America, from Europe. Particularly rich is the information from St Petersburg on our Russian burials and from London's Guildhall Library on our English burials and from the Swiss archives for this cemetery which precisely list each canton, each profession and even the mother's maiden name. And this site is more than just this small hill with its cypresses. Before the Risorgimento the Protestants and Orthodox buried their dead outside the gate of Porta a' Pinti, and we have paintings that show it as it was, with the road now named the 'Via degli Artisti' wending its way to Fiesole. 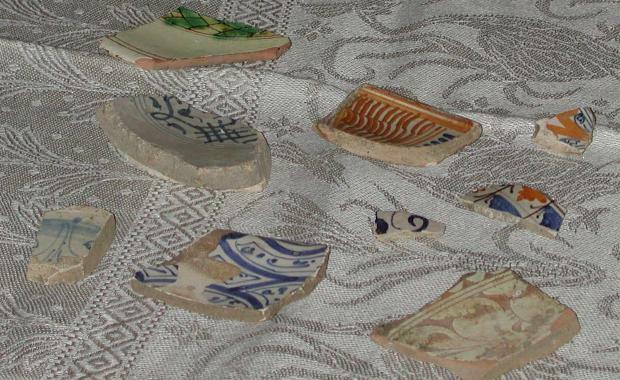 Before it was a cemetery it was a rubbish dump against the outside of the city wall, and its earth is full of shards of hand-painted pottery ware from the Middle Ages and Renaissance, which we now carefully collect and display. Carlo Reishammer, the architect who also arranged the exterior of the Duomo (which had from time immemorial been a cemetery, as indeed George Eliot describes it in Romola), first landscaped this cemetery. 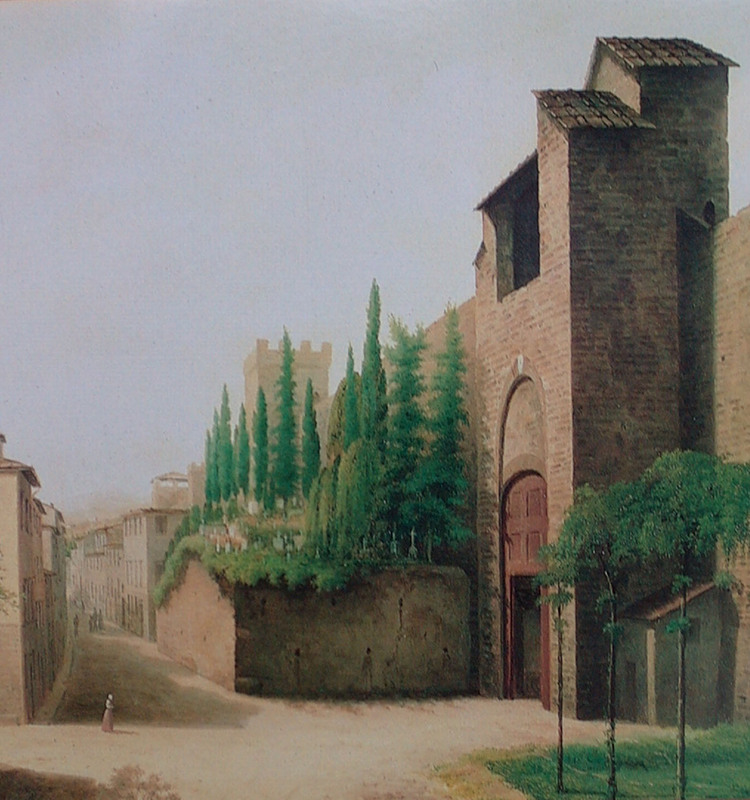 Then Giuseppe Poggi designed and built its present oval wall and iron railings, the medieval and Renaissance wall and gate, built by Arnolfo di Cambio and Michelangelo, being torn down, and great artists' studios built around this Piazzale. One of these was Michele Gordigiani's, who painted Elizabeth Barrett Browning and Camillo Cavour. In the studio's entry hall, nestled by the stairs, amidst frescoes of sculptors' studios, is this child drawing, as perfect a piece of Victorian sculpture as one could want, proficient and sweet. It is still in situ, not much respected, the post gets thrown at it and a piece is chipped off, but it is part of this 'living museum'. 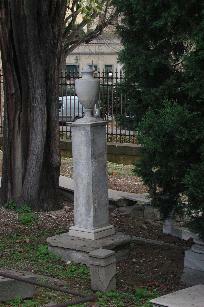 One day two cousins came to see their ancestress' grave, a classical urn on a column beneath the ancient cypress trees, and they arranged for its restoration. She had died in childbirth. I asked about the child. 'Oh, he's our ancestor, too! ', they replied. I asked them if there were a portrait of her. And they sent me its photograph. In it she looks as if she has stepped straight from the pages of a Jane Austen novel. Daughter of one Anglican clergyman, wife to another - who had to bring back his new-born motherless helpless babe to England. In this way, we can bring back the dead, through our collective remembering of them. This is what I now have on the Web for her. As one enters this door to the Library one steps back in time. For this space is also time. My custodian predecessor, an architect, had brutally modernized this building in which I write, putting in plastic window shades and metal shelves. I have gone back to wooden bookshelves, wooden curtain rods and rings, and damask blue green curtains, that remind me of Holmhurst St Mary's William Morris wallpaper, to bring back the past. And Savonarola folding chairs. A young artist from Norway has painted for us Giotto's Madonna that was on the altar of the Badia, that Vasari threw away, and which is now in the museum of the Uffizi, lacking its context. I have framed a page from a Riccardian manuscript with the head of Dante. Beneath it, every Thursday evening, by candlelight, we read Dante. Making books come alive. Above all, we seek books written by our illustrious dead in this cemetery, Elizabeth Barrett Browning, Arthur Hugh Clough, Walter Savage Landor, Fanny and Theodosia Trollope, Mary Young, Isa Blagden, and about Hiram Powers and Holman Hunt. We seek these books from the members of the 'Aureo Anello'. Associazione Biblioteca e Bottega Fioretta Mazzei e Amici del Cimitero 'degli Inglesi', our Friends of the Library and Cemetery (membership in the Library is through giving it a book). Who find the Victorian volumes on the Web and send them for these shelves. As well as more modern ones, including that just sent us by the Ashmolean Library. We hold an annual Book Fair with our City and Book international conferences in Florence, and M.Moleiro came from Spain with his most beautiful facsimiles of medieval manuscripts - and gave us one. Here we have made our own wooden bookcases, and used iron brackets hand-forged in Settignano for its shelves modelled on those of the Bodleian Library. Here we bind books, first printing these in William Morris Troy font, in reds and blacks, replicating manuscripts from the Middle Ages. Here we collect the shards of hand-painted pottery we find on our Cemetery's hill that come from the Middle Ages and the Renaissance. Here we frame paintings - and postcards, such as of the Gordigiani above - of our illustrious dead. Here we marble paper, doing this last outdoors, using Carageen Moss sent to us from Ireland, and ox gall, for separating the brilliant colours. 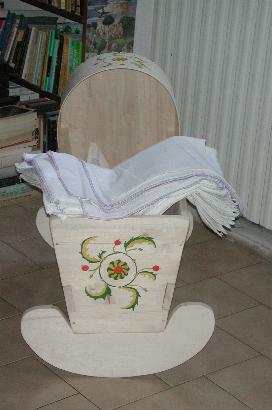 Here we make Rom cradles, five of which are in use with real life babies, in Romania, in an Italian family, in a Rom settlement, only one left in our museum. And we have hand-painted on all of them the design of pomegranates from the fresco in the Cardinal Bessarion's house in Rome. Here we digitise nineteenth-century photographs purchased by my Anglican Mother Foundress in Florence of Florence, of which this background is one. Our transport is to go on foot or by bicycle, for we run our library without money. Here we teach, amongst graves, that all is living, with skill, learning, love. The hand-loomed linen, that I bought in Florence's Straw Market, comes from Farfa Sabina where they still weave designs that go back millennia, to Constantinople on the Bosporus and to the land of the Tigris and Euphrates Rivers, the cradle of our civilization from whence derived our alphabet and our designs. The greatest violence of all has been in Baghdad, Iraq, where museums have been looted by war, objects, smashed or seized out of context. We force not only artefacts but living individuals with a rich culture into the present violence - which destroys history, destroys culture, destroys humanity, destroys meaning, destroys minds, bodies, souls. The Catalogue sent by the Ashmolean represents an earlier time, when museums still sought to be in context, to convey meaning. 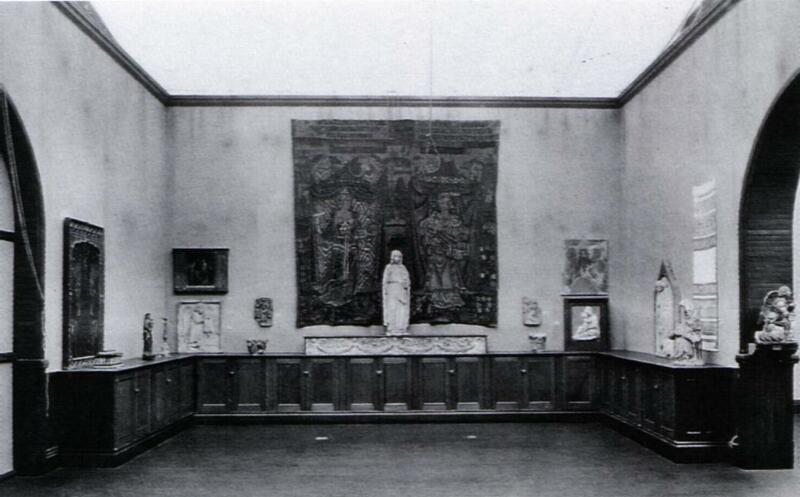 The Catalogue sent by Princeton similarly shows the rich gathering from all periods in one space as does the Tribune of the Uffizi, as does the Salone of Casa Guidi. It is our hope our Cemetery and its Library may do the same. Postscript: I have never before visited Florence's Archeological Museum, though I had often revelled in its Museum of the History of Science where one can even look through Galileo's telescope. This weekend Assunta and I explored this marvellous Florentine museum stuffed with Egyptian and Etruscan treasures for hours, first climbing its stairs to see before us the vast nineteenth-century canvas, redolent of Edward Said's 'Orientalism', with the young Jean François Champollion and Ippolito Rosellini together sketching in Luxor, Egypt. 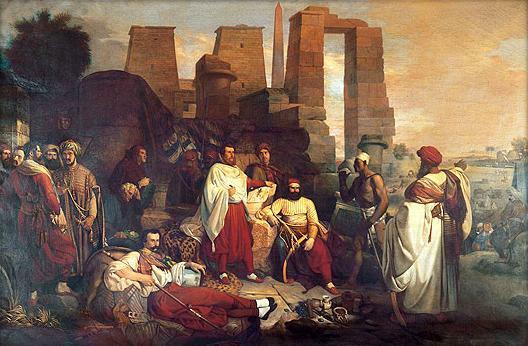 Why does no one today in Florence speak of this expedition in 1828-1829 the two made, funded by the Grand Duke, Champollion's first to the land of his studies of hieroglyphs? Between them they divided the spoils, half going to Paris, the other to Florence. Here these treasures are arranged, some in modern blonde wood cases, while others are in their original cabinets, carefully crafted in ebony and gold to match their contents in style, disposed about this palace. In a sense our museums today sanitize their loot, not evoking where they have come from or even the period in which they were collected. The Archeological Museum in Florence continues, partly, to celebrate its origin, and it is a glorious one. An archivist friend wrote the other day of finding in a Victorian diary a young woman drawing the design for Arthur Hugh Clough's tomb, taking it from Champollion's book. That same winged globe motif is on the gable of many of these ebony and gold cabinets.And of our tombs. Similarly the Risorgimento treasured the Etruscans and their love of liberty, Robert Browning giving Elizabeth Barrett the lilied ring, that Etrurian circlet, crafted by the Castellani patriot goldsmiths. Mary Somerville, the great mathematician and astronomer, buried her husband in our Florentine English Cemetery, noting on his tombstone that he was the son of the historian of Queen Anne, planting at the foot of his grave a myrtle. She is buried in Naples. Her portrait, like that of Elizabeth Barrett Browning, hangs in the National Portrait Gallery in London. Once it had a great carved wooden frame, sculpted by her daughter Martha Somerville in Florence, in her honour, copying that of Michelangelo for his tondo of the Holy Family in the Uffizi. Then museum curators threw it away. Just this June her myrtle bush was also rooted out and thrown away as being against modern rules. It is contexts that make contents so rich, so filled with meaning. For not only did we discover the Museo Archeologico Nazionale di Firenze, but they discovered us and mounted an ongoing exhibition of the Egyptian motives on the tombs of our Swiss-owned, so-called 'English' Cemetery. 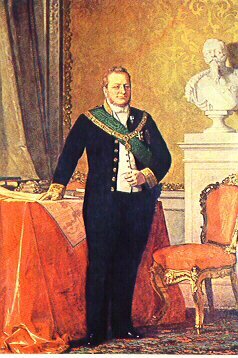 We were founded at the same time that the Grand Duke paid for the Expedition Champollion and Rosellini made to Egypt and Nubia. Which is why a black slave from Nubia, who came to Florence aged 14, is buried with us in her thirties, having been batpized in a Russian Orthodox family with the name, 'Nadezhda', 'Hope', her story told in Cyrillic on her marble Greek cross. 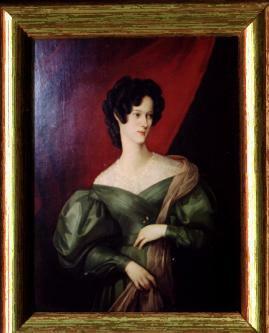 Elisa Camporeale. La Mostra del 1904 dell'antica arte senese a distanza di un secolo. 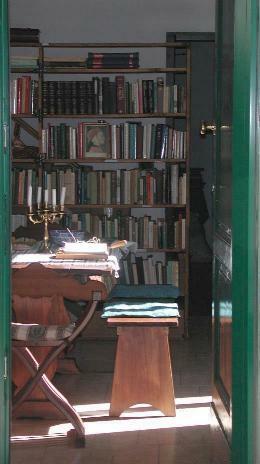 Firenze: Leo S. Olschki Editore, 2004. Hilliard T. Goldfarb. The Isabella Stewart Gardner Museum. Boston: Yale University Press, 1995. Geoffrey C. Munn. 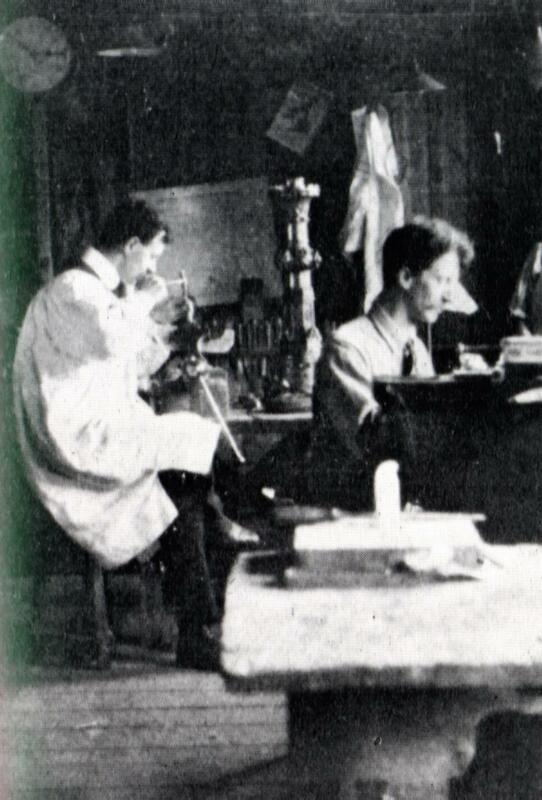 Castellani and Giuliano: Revivalist Jewellers of the 19th Century. New York: Rizzoli International Publications, 1984. Record of The Art Museum, Princeton University, 56 (1996). Victoria and Albert Museum Victorian Church Art Exhibition, 1971-1972.